In a video posted on Twitter yesterday, SpaceX CEO Elon Musk showed off the newest feature of the company’s much-anticipated Starship spacecraft: “heatshield hex tiles” that will keep it cool during re-entry into Earth’s atmosphere. 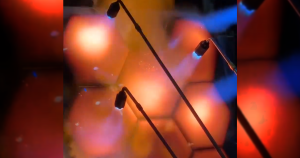 In the video, SpaceX engineers heated the hexagonal tiles to a maximum temperature of 1,650 degrees Kelvin (2,500 Fahrenheit.) According to Musk, that’s “orbital entry temp,” meaning it could technically survive the heat generated during re-entry — glowing a malevolent red that reminds you of the incredibly hostile forces of reentry. The tiles will only be cladding the hotter side that enters the atmosphere first — “no shield needed on leeward [or back] side,” according to Musk. Any “hot spots” will feature a “transpiration cooling” system, which allows the exterior to sweat water or methane to minimize damage and fly again soon after landing. Back in December, Musk tweeted a picture of Starship’s stainless steel nose cone, but powerful hurricane-force winds later caused the rocket to break free of its mooring blocks at SpaceX’s Texas test site, toppling it over. Most of the rest of the spacecraft is clad in stainless steel. In a January interview with Popular Mechanics, Musk argued that the stainless steel won’t become brittle even at extremely low and extremely high temperatures.